Two days bring about great changes, The banner of the Union floats over Vicksburg. Gen. Grant has "caught the rabbit:" he has dined in Vicksburg, and he did bring his dinner with him. The "Citizen" lives to see it. For the last time it appears on "Wall-paper." No more will it eulogize the luxury of mule-meat and fricassed kitten -- urge Southern warriors to such diet never-more. 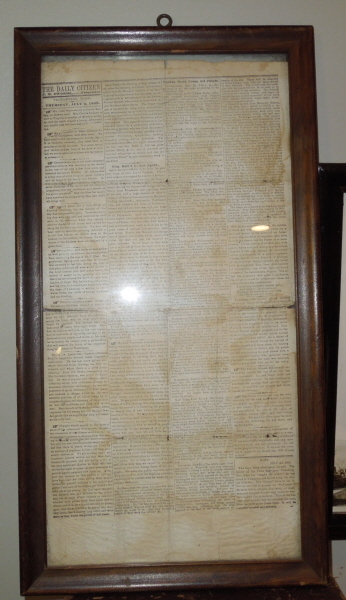 This is the last wall-paper edition, and is, excepting this note, from the types as we found them. It will be valuable hereafter as a curiosity. 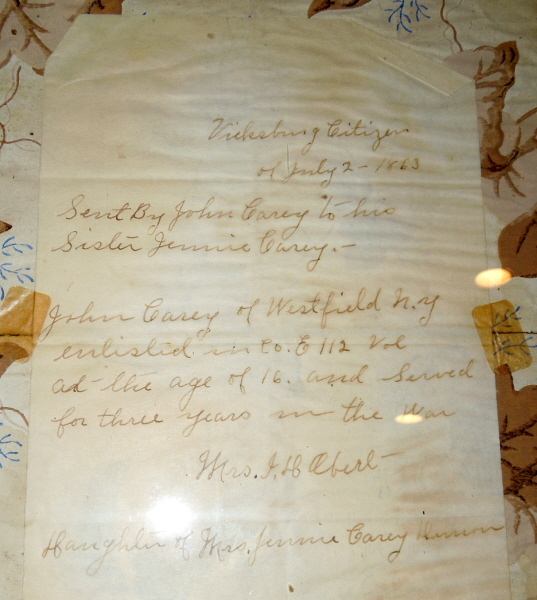 This one was read with glee by Union soldier John Carey of Westfield, NY in Company E of the 112th Volunteers. 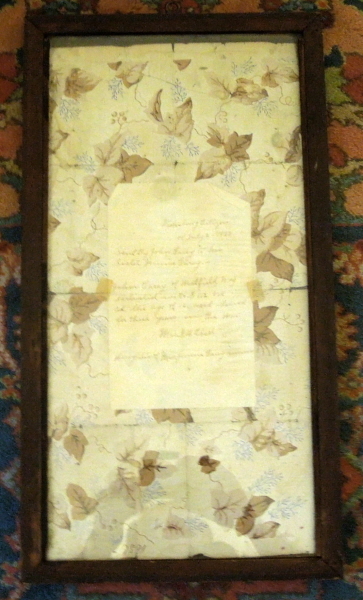 Private Carey enjoyed this so much that he folded it up and mailed it home to his sister, and somewhere soon after it was placed in this double sided frame with the old brown ink note about its provenance. This newspaper is extremely desirable and has been copied countless times. Following the link above to the Library of Congress yields the tests to see if this is an original or not. This copy passes all the tests except the mispelling of the words "secossion" and "whisttle." These were obviously corrected for a second printing, likely the same day or the next as the soldiers all clamored for this hilarious piece of history. 2 of the 4 copies in the Library of Congress have these spelling errors corrected just like this "second edition" version.